I am interested in how physiological tools can best be utilized to solve conservation problems. While I have focused mainly on the validation of glucocorticoids (stress hormones) in this context, I am also interested in how the vast array of physiological techniques currently available to practitioners may lead to successful management and mitigation strategies. My work in the Cooke Lab has focused on assessing how barriers related to logistics, interpretation, and translation of knowledge may limit the carry-through of physiological monitoring to conservation success. Currently, I am also investigating how artificial light at night influences the behaviour and physiology of common and at-risk fish species, with the goal of determining lighting strategies that can limit negative effects on native freshwater fishes. Madliger CL, Love OP (2016) Conservation implications of a lack of relationship between baseline glucocorticoids and fitness in a wild passerine. Ecological Applications. doi: 10.1002/eap.1401. Madliger CL, Love OP (2016) Do baseline glucocorticoids simultaneously represent fitness and environmental quality in a declining aerial insectivore? Oikos. doi: 10.1111/oik.03354. Madliger CL, Cooke SJ, Crespi EJ, Funk JL, Hultine KR, Hunt KE, Rohr JR, Sinclair BJ, Suski CD, Willis CKR, Love OP (2016) Success stories and emerging themes in conservation physiology. Conservation Physiology. Conservation Physiology 4: doi: 10.1093/conphys/cov057. Madliger CL, Semeniuk CAD, Harris CM, Love OP (2016) Assessing baseline stress physiology as an integrator of environmental quality in a wild avian population: implications for use as a conservation biomarker. Biological Conservation. Biological Conservation 192: 409-417. Madliger CL, Love OP (2015) The power of physiology in changing landscapes: considerations for the continued integration of conservation and physiology. Integrative and Comparative Biology 55: 545-553. Love OP, Madliger CL, Bourgeon S, Semeniuk CAD, Williams TD (2014) Evidence for baseline glucocorticoids as mediators of reproductive investment in a wild bird. General and Comparative Endocrinology 199: 65-69. Madliger CL, Love OP (2013) The need for a predictive, context-dependent approach to the application of stress hormones in conservation. Conservation Biology 28: 283-287. Madliger CL (2012) Toward improved conservation management: a consideration of sensory ecology. 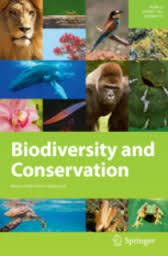 Biodiversity and Conservation 21: 3277-3286.